Today I ended up with some extra top sirloin. This meant I had to figure out what to do with it and I had so much fun making hacking the Plated recipe for French onion soup burgers, that I decided to hack something from Hello Fresh this time, as I’ve started trying their kits. 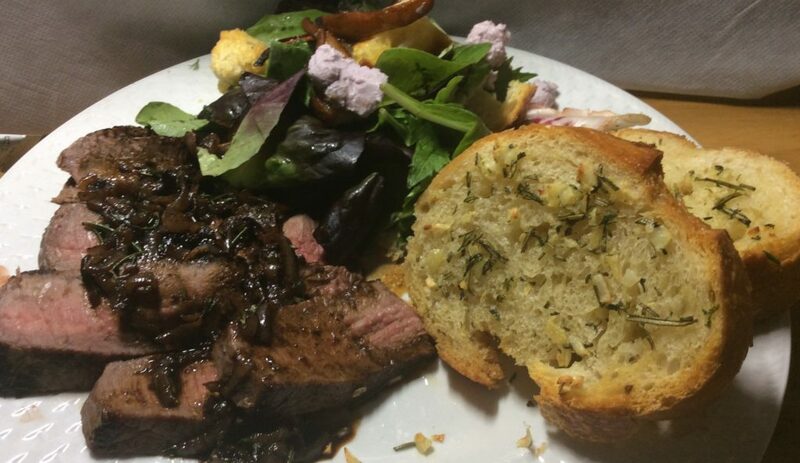 I decided on this recipe for “Balsamic Rosemary Skirt Steak with Garlic Herb Toasts and a Roasted Pear Salad” because I had most of the ingredients at home and it was one of their “premium” recipes, which cost an additional $12 per 2-person meal. There is no way that I’m going to spend $36 on a meal for two without leftovers that I have to cook myself, unless a rack of lamb or some prime beef is involved, so I can only try these recipes by making them with my own ingredients. In all, I spent $15.50 on the meal, less than half of what I would have spent if I’d bought the kit. I was lucky that all the substitutions worked great. Bosc pears are actually preferable for baking as they keep their shape. Sourdough bread (which I’d bought the day before and not used) is tastier than the plain baguettes and the croutons came out great. While I, myself, prefer skirt take, the top sirloin worked just as well and it was more tender than skirt steak would have been. And the blueberry goat cheese on the salad (for which I used the mixed greens I bought for my last hacked recipe) was a revelation. I did have to make the herbed butter myself, but it wasn’t too hard. I simply chopped a few fresh herbs I had around the house (rosemary from the side yard, basil and some of the living herbs thyme I bought for my last recipe) in addition to a couple garlic cloves and mixed it with softened butter. The overall meal was very good, and I loved that it had three elements: steak with a sauce, a grown up salad and herbed garlic bread – but it was a pretty laborious meal to make for that reason. Still, we both enjoyed the steak and the sauce certainly added flavor to a cut that I think usually needs it (as opposed to NY steak or rib eye which just need salt to be great). The herbed garlic bread was quite good and I very much enjoyed the salad. The blueberry goat cheese, in particular, was a revelation. I’d never had thought of putting it on salad otherwise, but it worked perfectly well. But hacking this meal also had me make a mistake: instead of using balsamic vinegar, which I did have in my pantry, I just used regular red wine vinegar for both the steak and the salad. If I had been using Hello Fresh’s own ingredients I wouldn’t have been able to make the mistake. I’m sure the balsamic vinegar would have improved the flavor of both. Below is my recipe for the salad. If you want to try this kit without having to make it yourself, you can use this link to get $40 off your delivery of Hello Fresh (it’s a referral link that will also give me credit towards a future purchase). Preheat oven to 400F. Line a baking pan with aluminum foil. Cut off ends from the pears, cut them in half and core them; then cut the pairs into 1/2″ wedges. Cube the bread into 1/2″ cubes. Place pears on one side of the prepared baking sheet and bread cubes in the other. Drizzle with olive oil and sprinkle with salt and pepper. Bake until the bread is toasted, about 8 minutes. Remove the bread cubes to a salad bowl. Turn the pear slices and continue cooking until soft, about 10 more minutes. Remove from the oven. Add the mixed greens to the bowl with the croutons. Add 1 Tbsp. olive oil and balsamic vinegar. Toss. Top with pears and crumble the goat cheese over the salad. Serve. My main adaptation was using “Better than Bouillon” bases and reducing the amount of water. You can use broth cubes/granules in the same proportions. This sauce is enough for two steaks plus whatever starch you are serving with them. Sauté shallots until tender on 1 Tbsp of butter in a saucepan over medium heat. Stir in sugar and cook for 1 minute. Add the broths, the broth bases and the cognac. Mix well and cook until reduced to 1/2 cup, about 10 minutes. Mix in the whipping cream and set aside. Sprinkle steaks with salt. Melt 1 Tbsp. of butter on a heavy skillet or frying pan. Add the steaks and cook over medium-heat, about 4 minutes per side. Remove. Add the sauce to the skillet and warm up, scrapping any browned bits. Season with salt and pepper.